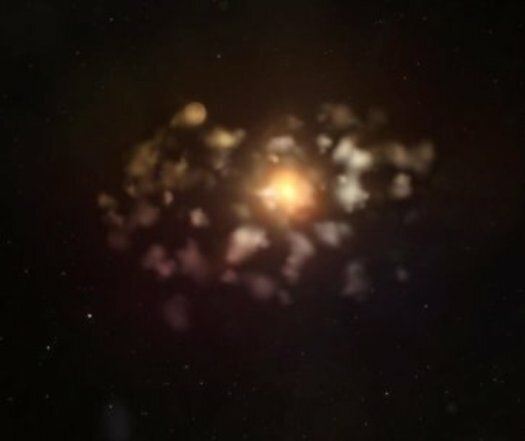 Like the ancient Greek god Cronus who devoured his children, a star 550 light years from Earth has been discovered to be slowly consuming its “offspring” — crushing one or more planets in its orbit into vast clouds of gas and dust. Doomed worlds that fly too close to their sun — only to be ripped apart by its tidal forces — are officially known as “disrupted planets.” In the case of RZ Piscium, the material near the sun-like star is being slowly pulled apart to create a small circle of debris about the same distance from the star as the planet Mercury’s orbit is from our sun. “Based on our observations, it seems either that we’re seeing a fairly massive, gaseous planet being pulled apart by the star, or perhaps two gas-rich planets that have collided and been torn apart,” Pilachowski said of RZ Piscium. Even solar systems whose planets are not lost to their sun are unstable in their early history, since newly born planets interact strongly with one another — as well as their sun — through gravity, she added. In our solar system, for example, some astronomers speculate that Uranus and Neptune swapped orbits about 4 billion years ago. But erratic orbits tend to stabilize over time, falling into regular patterns. An expert on the analysis of light spectrum from distant stars to determine their temperature, gravity and elemental composition, Pilachowski was responsible in the new study for determining the gravitational strength near RZ Piscium’s surface. The observation helped shed light on the star’s radius and brightness, both of which suggest a young star in the midst of a freewheeling solar system with unstable planets. This is significant because RZ Piscium’s age was uncertain. The debris field around a star can result from either the erratic orbits in young solar systems or the destruction of planets that occurs as an old star grows before collapsing and dying. Pilachowski’s analysis of the star’s light also helped determine the amount of lithium in the star, marking the star as a relatively young 30 million to 50 million years. Astronomers can use lithium levels to estimate a star’s age because the element declines over time. The study’s authors also found the star’s temperature to be about 9,600 degrees Fahrenheit (5,330 degrees Celsius) — only slightly cooler than our sun’s. Another sign of the star’s relative youth: It produces X-rays at a rate roughly 1,000 times greater than our sun.